Inspired by the 2008 opening of its new dining Commons and a $2.5 million gift from an anonymous donor supporting organic, natural and farm-fresh food, Bates College devoted the 2008-09 academic year to reflecting on issues, from environmental impacts to food justice, around what and how we choose to eat. President Elaine Tuttle Hansen convened the Nourishing Body and Mind: Bates Contemplates Food initiative to promote a greater understanding of food issues on campus. The Bates Contemplates Food Planning Committee, including faculty, staff and students, began the year with two major aims. First, the committee sought to highlight existing food-awareness programs at the College. Events produced by the College’s award-winning Dining Services drew attention to its longstanding commitment to healthy and locally grown produce. Campus organizations hosting events such as the College’s annual International Dinner found validation in the renewed dedication to food issues. The initiative also spotlighted existing food-related courses offered at Bates. Second, the committee wanted to raise consciousness about food sources, systems and practices. Public presentations sparked new awareness within the Bates community and beyond of the global and national impacts of our food system. The initiative both inspired new programs and activities, and served to highlight and connect a wide range of activities already taking place on campus. Bates Contemplates Food coincided with an October 2008 lecture, sponsored by the College’s Philip J. Otis Endowment, by influential food writer Michael Pollan. The celebrated author of In Defense of Food and The Omnivore’s Dilemma drew a crowd of 600. Also during autumn 2008, Bates’ annual Harvest Meal gave special attention to local foods. In the spring, Bates Students Against Poverty held an Oxfam America Hunger Banquet to demonstrate how food and other resources are inequitably distributed around the world. Bates showcased its commitment to purchasing healthy local foods. While the $2.5 million gift allowed the College to add bakery goods from Spelt Right, grass-fed beef from Cold Spring Ranch (both owned by Bates alums), fruit from Hilltop Raspberry Farm and Summit Spring Water to its list of local suppliers, Bates already had a sustained commitment to Maine purveyors. The College purchases 28 percent of its food locally, up from 14 percent in 2006, already exceeding the national “Real Food Challenge” goal. The College purchases 28 percent of its food locally, up from 14 percent in 2006. This investment already exceeds the goal of the national “Real Food Challenge” that 190 colleges and universities have joined: to purchase 20 percent of food locally by 2020. The College shone a spotlight on alumni involved in food work. 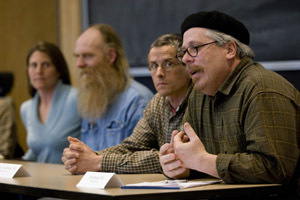 A panel in March 2009 on food production and nutrition in Maine featured Borealis Breads founder Jim Amaral ’80; St. Mary’s Nutrition Center director Kirsten Walter ’00; and Maine farmers Steve Hoad ’72, and Nicolas Lindholm ’86. The Bates Contemplates Food Web site featured events and dialogues happening in the Bates community. The site offers in-depth explanations of the thinking behind the initiative, including extended interviews with Hansen and Dining Services Director Christine Schwartz. In September, the Fellows of the Hobart Center for Foodservice Sustainability, an arm of the Hobart foodservice equipment company, announced a $5,000 grant to Bates College Dining Services for its comprehensive approach to food service sustainability. They also named Director of Dining Services Christine Schwartz as an HCFS Fellow. University Business magazine named the College as the top self-operated dining program in its “Dining Hall of Distinction” awards in October 2009. Bates will continue its commitment to sustainable food practices and awareness. Its academic exploration of food issues includes courses such as “Indigestible Memories of Food,” “Food, Performance and Community” and “Food in Ancient Greece and Rome.” Beginning this academic year, the capstone project for environmental science majors will be organized around an interdisciplinary study of food, food economy and food ecology. Bates’ Harward Center for Community Partnerships continues its robust partnerships with food-centered organizations such as the Trinity Jubilee Center, a nonprofit soup kitchen; and Lots to Gardens, a community garden program founded by alumna Kirsten Walter. The office of President Hansen will sponsor one annual event under the Bates Contemplates Food theme to keep food front and center in the campus consciousness. “I have learned over the course of 35 years of community food work that if you succeed in getting somebody’s head ‘above the plate’ — that is, they learn something more about their food than simply how it tastes — you have accomplished something of importance,” says author Mark Winne ’72.